We have done the White Mountain bike climb five times and would do it every year if we had the chance. We love this climb and the area around it. This is a beast of a climb - long, steep in spots, and extremely hot in the lower third during the summer. We start at the intersection of Hwy 168 and Death Valley Road, after all! The White Mountain bike climb ranks #3 most difficult in California, #9 in the U.S. and #72 in the World and is one of the nine Top 100 U.S. climbs that begin in the Owens Valley (Top World Climb Page link for Owens Valley) on the eastern side of the Sierra Nevada mountain range in the central/eastern portion of California. When to climb White Mountain by bike: The average high temperatures for the summer time frame are 92 June, 98 July and 96 August. We suggest May or September as you could encounter snow during the months just before or after as the finish of this climb tops out just over 10,000’’. How to climb White Mountain by bike: Pick the right time and train well as this is an extremely challenging bike climb at 20.3 miles, 6,509’’ gained at 5.8% average grade (¼ mile at 11.3% and ½ mile at 10.7%). Climb begins at the intersection of Hwy 168 and Death Valley Road, Big Pine, CA 37 (37.18501, -118.25297 latitude/longitude). We commonly stay in Bishop, California (15 miles north of Big Pine, CA and the start of the White Mountain climb) at the Creekside Inn, next to Erick Schat’s Bakery. This ride can be broken into two segments - Hwy 168 (10.5 miles, 3,347', 6.3%) . . .
Hwy 168 tiny canyon at mile 8.
. . . and White Mountain Road (9.5 miles, 3,029', at 6.2%). is home to the oldest trees in the world, bristlecone pines. One of the highest paved roads in California. There are some spectacular photo opportunities and backdrops available along the way . . . The climb ends about .3 miles south of the Ancient Bristlecone Pine Forest Visitor Center, home to the world's oldest living tree, and there are some breathtaking views of the Eastern Sierras to the west as you near the summit. 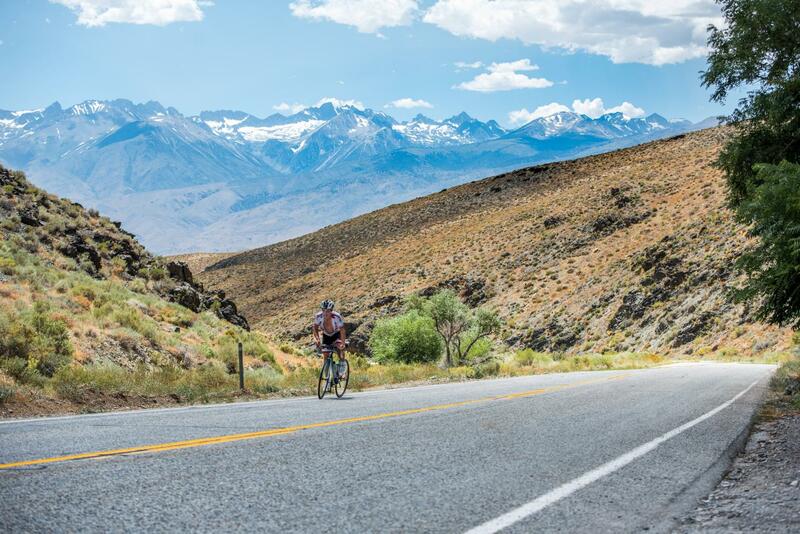 The lower portion of the climb is arid and desert-like, as you would expect for a ride that begins at Death Valley Road, but it gives way to a more high sierra alpine setting as you climb into the Inyo National Forest. In June 2013 we rode four of the Top 5 California climbs in a day - first Horseshoe Meadows, then Whitney Portal, next Onion Valley, and finally White Mountain. It came in at a total of 22,000’ and was a very difficult day. In July 2015, we reversed the route - 1. White Mountain, 2. Onion Valley, 3. Whitney Portal and 4. Horseshoe Meadows. Thanks Julie and Steve - that hurt! Started White Mountain. 2015 . . . but . . .
. . . Didn’t look so spry 15 hours later! Traffic and Roadway report: The roadway surface is excellent. The first 10.5 miles is on U.S. Hwy 168 which has moderate to light traffic, although it can whiz by at 50-60 mph. The final 9.5 miles on White Mountain Road are very safe and low traffic - we have encountered very little traffic during our 5 ascents of this mountain. We have climbed White Mountain, Owens Valley, 5 times and would do it every year if we had the chance - we love this climb and the area around it. This is a beast of a climb - long, steep in spots and extremely hot in the lower third during the summer (we start at the intersection of Hwy 168 and Death Valley Road after all!). Other HC climbs within 50 miles of this climb are Death Valley Road (West), Glacier Lodge, Lake Sabrina, South Lake, Death Valley Road (East), Pine Creek, Onion Valley Rd, Rock Creek Road, Whitney Portal, and Horseshoe Meadows Rd. Access these other climbs by clicking "Routes in Area" on the climb card above right.